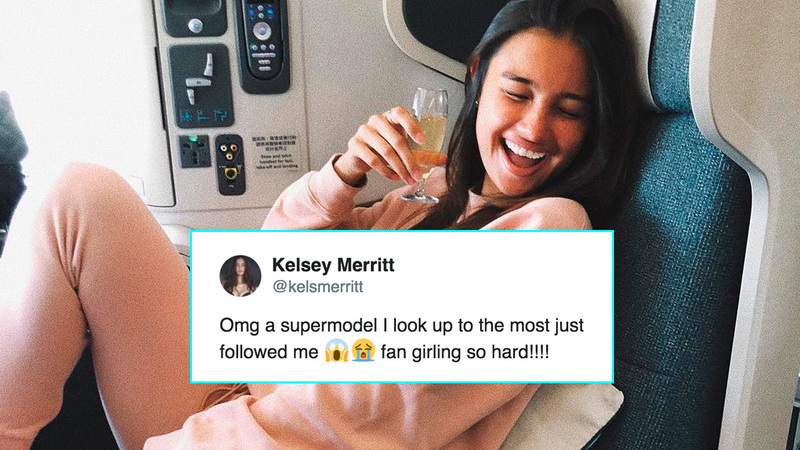 Kelsey Merritt is on her way to conquering the international fashion scene one project at a time—from Victoria's Secret to her slew of memorable campaigns. But in truth, the Fil-Am model is still a regular 22-year-old who fangirls over people she looks up to. Case in point: A recent follower she gained. To be more specific, it's a ~supermodel~. Kelsey tweeted about it and wrote, "Omg a supermodel I look up to the most just followed me. Fan girling so hard!!!!" But who is it?! Well, some Twitter users did some sleuthing and found out that supermodels Candice Swanepoel and Miranda Kerr both follow Kelsey on Instagram. Like, OMG?!? But what's the connection between these three models? It must be because of Victoria's Secret: Both Candice and Miranda are VS Angels (with Miranda retiring her Angel wings in 2013), while Kelsey made her VS debut in 2018.